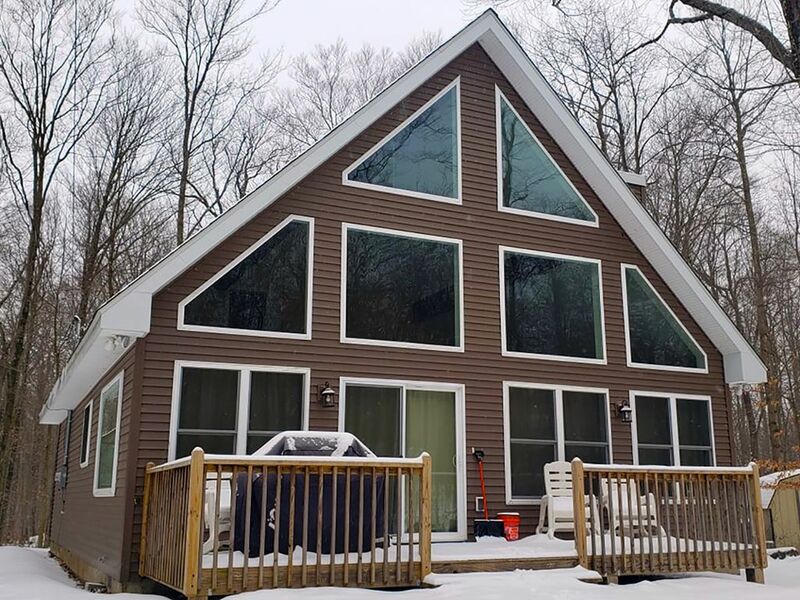 Welcome to a brand new Chalet locate din Arrowhead Lake, PA. This rental is in Arrowhead Lakes, a gold star and gated community, in the secluded Pocono Mountains. With 2 lakes, 3 pools, tennis courts, and a host of activities for the family, it is an ideal destination for any vacation. Take time away from your busy day – to – day and into one of our beautiful rental homes. Our homes are private, secure, and conveniently located by many natural and business attractions. Each season has a unique atmosphere found only here in The Pocono Mountains! >>You will “FALL” In Love with The Poconos During September, October, and November! The unique blend of reds, yellows, and oranges make for breath taking pictures and memories. >> Are you ready for the Winter? Ice Fishing is very popular on our many lakes. >>Book With Us For The Holidays! Vibrant time of year. Many outdoor activities! Watch the foliage bloom, blossom, and come to life! You may come across wildlife and offspring during your stay! >> Summer is the BEST TIME in The Poconos!! your vacation starts with where you stay! message we would be very happy to answer any questions you may have. Linens are provided - You must wash / dry / fold if you use them! Towels are provided - You must wash / dry / fold if you use them! We loved arrowhead lake community. It was our first time there, and it was beautiful. The beaches are nice and not too crowded with a very family oriented feel. The island pool was also nice. Over all I would definitely recommend it. It’s a good beginning when you show up at a rented house and it turns out to be even better than pictures suggested. The place is modern, clean, well appointed, and with lots of light. ReMax team made check in easy and took care of small things like making sure there is extra propane tank for the grill. loved our stay and would highly recommend it. This is a very nice house in a community that has a lot to offer. It was just the right size for our family of 5. We enjoyed the quiet location and found plenty of things to do there and in the surrounding areas. We had an issue with one of the tubs not draining properly so were forced to all use the upstairs shower. This was inconvenient. Also, be warned that the things provided are exactly what they list. Being that this house is 10-15 minutes from any place you can get supplies, you literally need to bring everything you need for any recipe or meal you want to prepare. Since you are not likely to eat out every day (again, you are not near much), the kitchen was not as friendly for a family driving from 3 hours away as I would have liked. The only thing there is salt and pepper. The description never said there was more, but it still surprised me that there were no basic staples at all. Overall, our experience was positive. The week was very relaxing and exactly what we needed. Frank was very responsive as we were making our reservation and arrangements. Thanks for sharing your home with us! Property is clean, bright, and private. My family and I had a wonderful time despite the rainy weather. Family/ friendly area...we had a group of nine people. Would definitely stay again. Thanks for the kind words! We try to make each renter's stay easy and are very happy when we hear that were able to do so! We are glad that you enjoyed your stay at this home as the owner tries to make sure it is the very best that it can be! Great Place to Relax ! This is our vacation home, nestled in the woods at Arrowhead Lakes. Thoughtfully designed to make your stay a relaxing retreat. We usually spend the weekend here tubing, skiiing, enjoying the outdoors and the beautiful house. Open floor plan, spacious rooms and great for entertaining. The kitchen is well stocked and ready for all your needs. If there is anything we can do to make your stay more pleasurable, please let us know. Enjoy! Located in an Amenity filled gated community it is the perfect place for a family summer vacation as well as that winter skiing weekend! Arrowhead has 3 outdoor pools (all heated), tennis courts and 2 lakes to enjoy! A new lodge that has the latest fitness equipment and a pool hall! This is a gated (2 entrances) community that has 24 hour security to provide additional safety! Plenty of natural and local business attractions within a 30 minute drive! Cleaning Fee: $100 Arrowhead Gate pass $15 Amenity badges $35/week, $8/day for everyone over 12 during summer months Arrowhead Lakes Processing Fee: $20 Must be 23 years old to rent this property We accept credit cards, renter is responsible for the credit card transaction fee.